Johannesburg born, Zesta has a passion for contrasting various styles of visual art from comical, portrait, realism to graffiti. 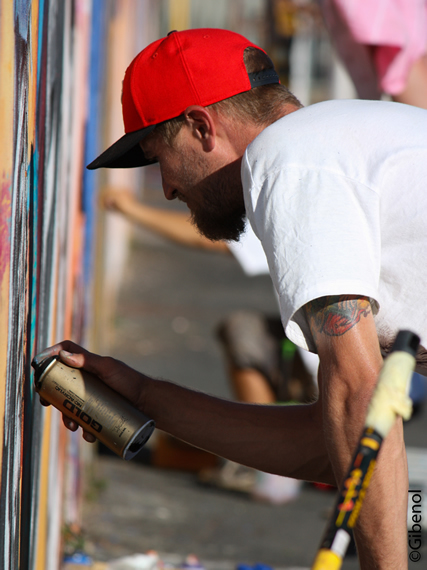 He is best known for his ability to capture exceptional detail while using a spray can. He was introduced to “graffiti” in the year 2000 and the art form soon became an obsession which he lived, breathed and bleed for. He prefers large scale murals, as it is free to enjoy by the masses but also appreciates creating work digitally and on canvas too. For the International Public Art Festival he collaborated on a 80m long masterpiece with Page33, Spear and Linus. The quartet, all from very different backgrounds came together in perfect harmony producing one of the most conversational murals for this year’s festival. Their attention to composition indeed paid off and can be observed through their witty yet relatable showpiece. He values the strong concept behind their mural. It pays respect to the culture and heritage of the Salt River community and makes reference to the current water crisis in Cape Town. They incorporated portraits of community members in a depiction of the “Klopse” in procession, replacing the instruments with utensils used to collect water. The shoes and hands make reference to the youth staying true to their culture and having faith. Flamingos have been included as one often finds them where hot and dry environments meet water based ecosystems like dams and watering holes. 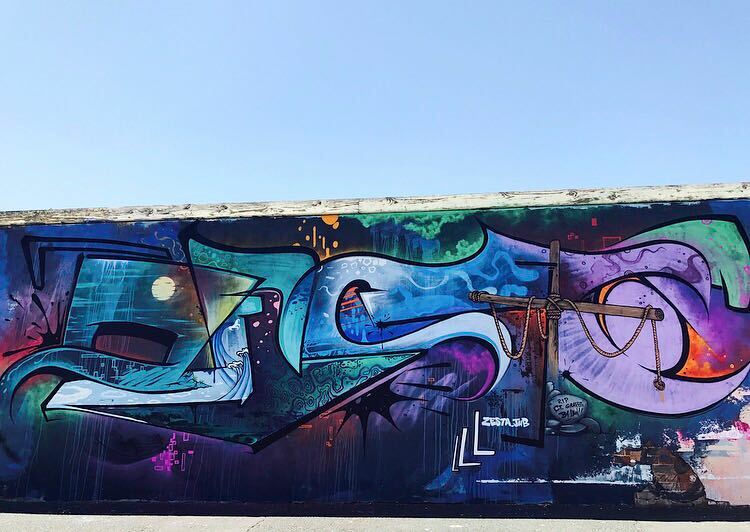 For Zesta, the theme of the Cape Minstrel parade “Klopse” almost becomes a “rain dance” for Cape Town and a mural that will hopefully resonate a narrative and documentation of Cape Town culture and her people’s strength and resilience to challenges, for years to come. He believes that the mural will serve as a message to the youth to continue embracing their culture, as well as a wakeup call to the City concerning the power of public art and how necessary it is concerning a shift in overall thinking of its residents. He has faith that the IPAFestival will serve as a resounding example of how public art can be embraced by the city. His message to our governance will be to “Allow your city to reflect the vibrancy and beauty of the people and its the culture”.